Saving the world one wave at a time. You may think of surfers as shaggy-haired dudes who hang out at the beach all day without a care in the world. But the Surfrider Foundation represents more than that. We’re not all surfers. We’re not all guys. And though we do like to hang out at the beach, we’ve got plenty of cares about the world. Launched in 1984, the Surfrider Foundation is not-for-profit environmental organization dedicated to the protection and enjoyment of oceans, waves and beaches. Our work is accomplished through a powerful network of activists and beach enthusiasts in chapters all along America’s waterways and in 15 countries. Currently, there are 80 chapters in total. In the greater New York region, there are chapters in New York City, Long Island, Connecticut and New Jersey. Each chapter works at the grassroots level to address the coastal issues in its community through a series of campaigns related to the national mission. In some areas, protecting free and open beach access is the greatest concern. Other regions have energy-related issues, such as offshore oil or gas operations. Many chapters are raising awareness about the impact of single-use plastics left behind on beaches and washed out to sea. Pollution issues such as sewage dumping are also major areas of engagement for the organization. The New York City chapter’s focus has traditionally been on Rockaway Beach in Queens, an urban shorefront with a long history as a popular surfing spot. As a New York City park, Rockaway permits people free access. But like many public areas, trash and cigarette butts are often left behind. To address this, Surfrider NYC hosts regular beach cleanups as part of a strategic education program. Several weekends during the summer, you’ll find Surfrider volunteers walking the beach with bags to pick up the Styrofoam, straws, bottle caps, plastic bags and any other litter left behind. Through these activities, volunteers share the Surfrider mission, talk about current campaigns affecting beach-goers and grow the network. It’s an effort that anyone can join by visiting the organization’s Facebook profile and reading its Twitter feeds (@SurfriderNYC). Our actions are often allied with the national campaigns like Rise Above Plastics, which aims to reduce the reliance on one-time-use plastics such as grocery bags and take-out food containers. If you live in a community with a strong recycling program, you know that not all plastics are alike. Each one comes with a number that helps users to know what type of recyclable it is within that community. New York City recycles only bottles and jugs stamped with the number 1. But Surfrider advocates for the reduction of use to eliminate waste and the cycle altogether. Another key initiative in New York has been the Butts Campaign, which has a clear message: The beach is not a giant ashtray! Several beach cleanups have been devoted to picking up and cataloging the volume of cigarette butts deposited on the beach. As of May 2011, smoking on the beach is no longer allowed in New York City’s public parks, including beaches, because the City Council passed the smoking ban. The reality though is that this rule is hard to enforce. The chapter is engaged in an effort, along with key stakeholders, to place proper receptacles at key points before entry to the beach and boardwalks. 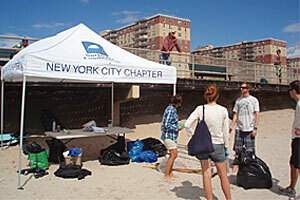 Surfrider NYC also allies with many local and international nonprofit organizations and causes. Our activists have volunteered to mentor students involved in Stoked, a nonprofit that encourages surfing, skateboarding and snowboarding in a balanced life with employment and civic activism. Surfrider’s volunteers and advocates have also visited neighboring communities facing pollution issues. Long Island’s Nassau County, for example, has confronted sewage dumping in a channel that is popular for fishing and swimming. Though the dumping was stopped, there is currently no requirement to notify the public when and if more sewage will be dumped. Who wants to swim and surf in sewage? No one! Surfrider NYC is active in encouraging members to sign petitions in favor of notification rules. Likewise, Liquefied Natural Gas (LNG) opposition has been an ongoing campaign. A mysterious company proposed a port facility on a man-made island 13 miles off the coast of Long Island. Surfrider NYC and partners opposed the LNG facility for its potentially huge environmental and recreational implications. The Surfrider Foundation is comprised of people who volunteer, surf, paddle and splash around at the beach. We love the coastline, and we want to ensure that future generations can frolic as we have. We hope you’ll join us for both work and play.